Have you ever found something on accident and completely fell in love with it once it grew on you. I was in goodwill recently and saw some purple shorts. Now..I don’t usually look in the shorts section because I’m convinced they will all be Mudd low rise getups and I’m just not quite ready to bring those back. 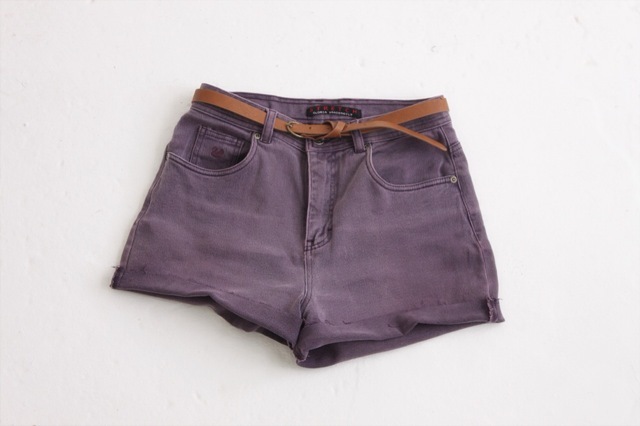 After thumbing through a few fails I found a purple pair of purple jean shorts. I think what really drew me in was the brilliant purple color. It’s perfect for pairing with patterns and even basics. Having never owned a pair of purple shorts I told myself that this might be the pair I’ll learn to love. Once I took them home I looked at the tag and they said Gloria Vanderbilt. She came out with designer denim in the 80’s right around the time that Jordache was popular. Vintage certainly speaks to me. This wasn’t the only time where I picked up something from a consignment store, brought it home, only to find it’s dated worth when I got home. It has to be the fit that has a consistency. Whenever pants wrap around my waist nicely, I am sold. I don’t care too much for anything that sits lower than mid-waist. It’s not only a comfort thing but just how I think my body responds to it. Thanks Gloria for making me a believer in purple pants!